Verstraete in mould labels, one of the world’s leading players in the production of IML labels, has partnered up with 34 companies to show 16 IML systems at the upcoming K Show (Germany, Dusseldorf, 16th till 23th of October 2013). To make sure that all visitors get the details of each running IML machine using their labels, Verstraete in mould labels has made a very useful app you can request on www.verstraete-iml.com/k2013. 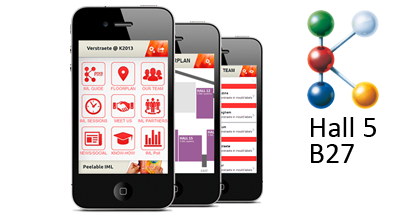 Next to all machine details and their location at the K Show 2013 the app also gives you an insight into multiple IML innovations. During the show there is a continuous update on IML news, pictures and interesting IML sessions. For the first time Verstraete IML has its own booth in Hall 5, booth B27. At this location you will have the opportunity to discuss all of your new upcoming IML projects with IML specialists. There is a clear focus on IML innovations during this K Show: Oxygen and Light Barrier, Mock-up digital printed IML, DoubleSided IML, Metallic IML, Laminated IML and Peelable IML are all novelties which the Verstraete team can elaborate on during the K-Show.